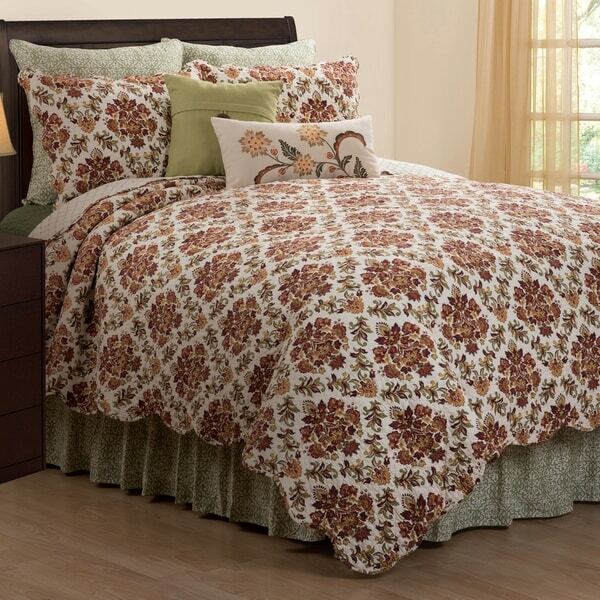 Rest among the beautiful geometric floral pattern of the Addison quilt set. Flowers in a fall color palette of crimson, yellow, green, and orange create a damask-inspired diamond pattern atop a white ground. Reverse to a green lattice pattern for alternate styling options. Pair with our Jocelyn, green envelope pillows, Althea shams and bed skirt to complete your bedroom makeover. Trimmed with a scalloped edge and crafted of cotton, the Addison bedding set is machine washable for easy care. Coordinating accent pillows, euro shams and bed skirt available separately. "Where can I find the envelope pillows, shams and bed skirt mentioned in the description?" Unfortunately they are not available.